When your kitchen lacks a dishwasher you'll do anything imaginable to cut down on dirtying dishes—including drinking directly from the faucet. 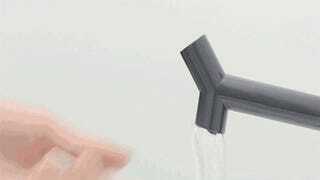 But instead of having to lean over and use your hand as a cup, Alice Spieser has designed a simple dual-nozzled faucet that easily becomes a drinking fountain with some strategic finger placement. To ensure it's cheap and accessible (why should only the rich be able to drink from their faucets? ), Alice actually made her Down Up tap using a 3D printer. The only moving parts are found in the disk that controls the amount and temperature, otherwise it's left to gravity to ensure the water simply flows into a basin until a finger blocks its path, turning it into a fountain.